I had been seeing this patient for 6 months before I realized that he had never bought a seat cushion from me. As you can imagine, this is rare. All of my patients get trained in how to sit correctly to ease their back and neck. I asked him one day why he hadn't bought one and he said that he didn't need to because he had found one, exactly the same as mine, when he was at the Boise airport. Someone had left it in a terminal chair when they boarded their flight. I've had many patients tell me that worst thing about leaving their seat cushion someplace ISN'T the cost of replacing it, but of then having to suffer the rest of their trip without one. For those of you who travel you know how hard it can be to remember to pick up your seat cushion every time you get up. When I traveled with my children we would play a game where I put a bounty on my seat cushion. If I ever got up and left it, they could get it for me and claim a dollar reward. Although most of the time I "lost" it on purpose, they did save it for me many times for real. HERE'S TODAY'S TIP: use something, like the lanyard above, to attach your seat cushion to your belt, purse, or briefcase. The lanyard picture above is also a link to purchase one at Amazon. 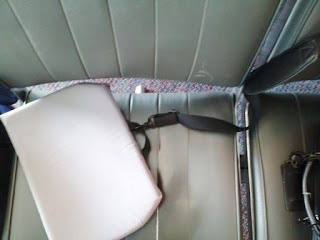 In the picture of my seat cushion you can see that I attached my briefcase handle to the cushion. Then, as long as I don't leave my briefcase, I never leave my seat cushion behind.